on verso inscribed by A.J. Casson on August 14, 1979: "In my opinion this is a genuine Franklin Carmichael sketch"
In 1917 Franklin Carmichael was working for the commercial art firm Rous & Mann Ltd. in Toronto, and he lived in the villages of Thornhill and Lansing. Thus his subjects at this time were taken from the surrounding southern Ontario countryside, and his style incorporated flattened tapestry-like forms, inspired by Japanese design and Art Nouveau. Carmichael was often attracted to views through a screen of trees to the landscape beyond or open landscapes with a cluster of trees. In the Trees is such a work, a subtle study of a house almost hidden in a copse of trees. Carmichael shows a sophisticated use of tonally related greens that vary from creamy light green and pale olive to rich emerald. Hills in the distance give a sense of depth, and the upward diagonal direction of the clouds in the sky adds drama and movement to this pastoral and peaceful scene. 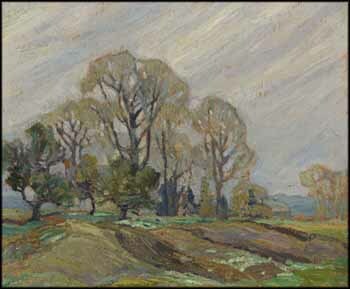 This sensitively rendered oil sketch encapsulates Carmichael's affection for this gentle and evocative rural landscape, and he included works such as this in the Group of Seven's first exhibition in 1920.